In a follow up to my previous post on burn up charts, I sent an email this is adapted from to members of the team. 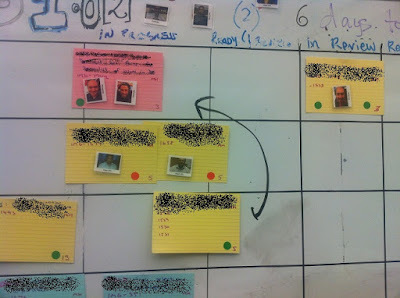 In it I expanded on the use of Burn up charts in tracking progress on multiple release projects. All names have been changed to protect the innocent. First burn up chart for Project X Vers 1.0. - We can say, with what we know so far, the likely release dates is sometime between Sprint 7 and Sprint 16. The band of uncertainty – A burn up chart story. With most agile projects, change is one of the few constants, its this paradox that makes traditional project management forecasting tools obsolete (if they ever actually worked in the first place). Gantt charts react poorly to change if it happens every day, chucking hissy fits and requiring far too much time to maintain. 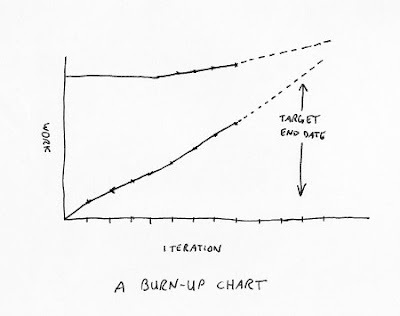 There is still a need however to be able to track project progress towards a goal, especially projects of many sprint lengths.I have started using Burn up charts as part of my end of sprint reports which are sent out to all the interested parties on a project including team members and other stakeholders.